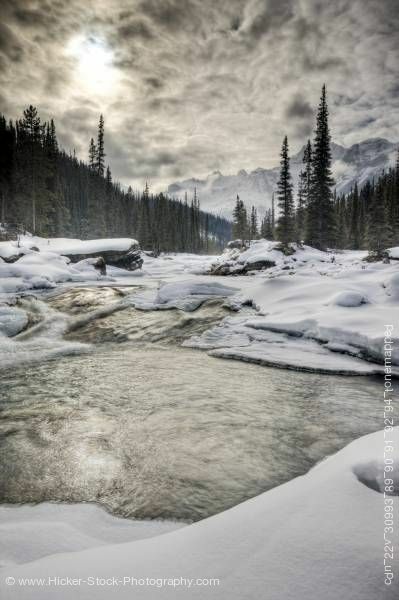 This stock photo includes the flowing water of the Mistaya River surrounded by fresh snow and ice during winter with Mount Sarbach (3155 metres/10351 feet) in the background, Mistaya Canyon, Icefields Parkway, Banff National Park, Canadian Rocky Mountains, Alberta, Canada. Banff National Park forms part of the Canadian Rocky Mountain Parks UNESCO World Heritage Site. Mistaya River is a short river in western Alberta, Canada. It flows through the Canadian Rockies, and a section of the Icefield Parkway was built along its course. Mistaya River originates in Peyto Lake, a glacial lake of typical blue colour (due to rock flour). Mistaya flows north-west, receiving the waters of creeks such as Delta, Silverhorn, Cirque, Noyes, ChephrenTotem, Epaulette, Bison, Kaufmann and Sarback. A series of elongated lakes are formed along the river: Mistaya Lake and Waterfowl Lakes. Mistaya merges into the North Saskatchewan River at Saskatchewan River Crossing. From its headwaters of Peyto Creek, Mistaya River has a total length of 38 km.